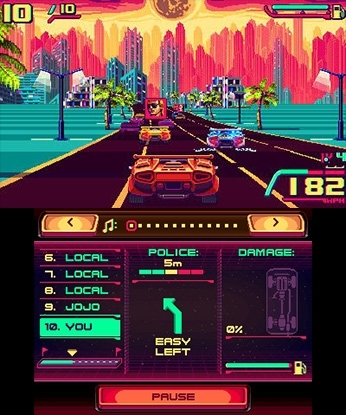 There's no "maybe" or "possibly" about 80's Overdrive's biggest graphical homage: it's undeniably inspired by 1986's OutRun. 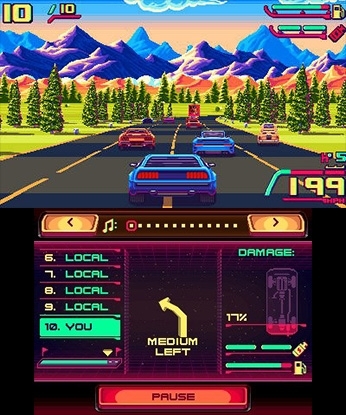 It mimics the Super Scaler technology of the classic racing title, where sprites scale en masse in rapid succession to create the illusion of 3D, copies its striped pavements, uses backdrops such as beaches, forests featuring trees galore, locations with countless arches, and does so with crisp, 2D sprite art. Backgrounds parallax scroll like they're going out of style, as well. And with all this comes the option to select music prior to each race, forgoing the tropical, feel good melodies for techno tunes that attempt to imitate the sound of the era. 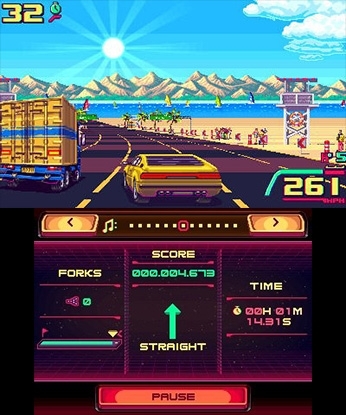 While the devs have succeeded in creating a visual throwback to OutRun, 80's Overdrive goes a different path when it comes to the way races are handled. 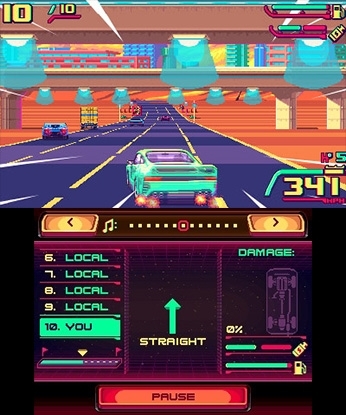 Instead of one long race across numerous branching routes and various regions, you're now performing in a traditional competition on "shorter" tracks, against nine opponents. With over 30 races to compete in, each one has to be unlocked by placing first, and it isn't going to be simple since everything revolves around money; entering a race requires a fee, which mounts the more you advance; upgrading your vehicles for better handling and speed needs cash; fuel consumption demands currency; and most importantly, constant misconduct done to your car, from clashing with traffic or crashes, is going to need a huge sum of money. The game's team ensured quite the challenging journey for those expecting a decent length to their racing titles, due to money spreading things out and the punishment that comes with contact to anything. Regrettably, both aspects act more as a burden than genuine feats to overcome, with the latter being more transparent. Now, the occasional fender bender or roadside crash is a given, considering how many opponents or oncoming traffic you have to dodge on tracks that twist and turn. The way 80's Overdrive handles consequences, however, is absurd. This is the kind of game where, if you're in first place and bump into another car just once, your opponents zoom into the horizon, even the car you collided with, likely placing you dead last. Use the purchasable nitro boost? More times than not, it's outright useless for catching up. You can imagine what a roadside accident does to your morale, earnings, and repairs... This results in returning to earlier races just to grind for more money. I haven't reached the scummy part, yet: repair costs build after every race. I'm not talking about repair costs building because you continued causing damage to your vehicle... I mean, repair costs climb even when you don't cause additional damage to your car. I had a situation where my vehicle sustained 57% damage, and I had to spend 2271 dollars for repairs. I took a risk, didn't pay up, entered the next race, and won without further harm. Still at 57%. But the game then demanded I pay 3251. I took another risk by repeating the same method with the subsequent race. Won. No extra abuse. Still 57%. Game now wanted me to pay 4140 out of my 4529 total earnings. Great, right? The game was literally yanking hard earned money away from me for skillfully keeping my car alive and untouched. Time to grind after repairs! You know what's worse than annoying methods that make the game needlessly harder than it should be? The fact that, in the end, none of it really matters. You can have a race where you easily pull ahead in first place, stay there for 99% of the event, then suddenly make a risky move due to heavy traffic during a tight turn, crash your vehicle, which is going to cost a lot to fix, and get knocked to tenth place where you'll receive no prize money. It's a no-win situation... but not really. You can undo all this simply by... pausing during a race and selecting the restart button. It reverts to before receiving any damage, so you can redo any race as many times until you finish in first and avoid any severe punishment for mistakes. This one feature completely destroys 80's Overdrive's biggest challenge. Yes, I know I made a paragraphs-long rant about the game's ridiculous "difficulty" design, but I would rather plod through that experience than have this magical reset button in existence. And sure, if people really want, they could just exit out and restart the whole game if the feature was taken out. But there are obvious workarounds to that problem: program a form of punishment for players leaving mid-race. I mean, this is a major bumble; this has to be something they overlooked when making the game. Because why would you go so far out of your way to design the game in such an irritating, imposing manner, only for it to be undone with a simple tap in a menu screen? The saddest part? Take away the issues and flaws, and 80's Overdrive plays fine. Unfortunately, all the nonsense thrown on top of its core overshadows what could have been a solid callback to racers of yesteryear. If you enjoyed this 80's Overdrive review, you're encouraged to discuss it with the author and with other members of the site's community. If you don't already have an HonestGamers account, you can sign up for one in a snap. Thank you for reading! None of the material contained within this site may be reproduced in any conceivable fashion without permission from the author(s) of said material. This site is not sponsored or endorsed by Nintendo, Sega, Sony, Microsoft, or any other such party. 80's Overdrive is a registered trademark of its copyright holder. This site makes no claim to 80's Overdrive, its characters, screenshots, artwork, music, or any intellectual property contained within. Opinions expressed on this site do not necessarily represent the opinion of site staff or sponsors. Staff and freelance reviews are typically written based on time spent with a retail review copy or review key for the game that is provided by its publisher.